California’s gas utilities have had their share of problems in recent years – so improvements in environmental impacts, operations, and safety are important to track. In 2014, the California legislature passed a law to require utility companies to publicly disclose data on gas leaks and emissions while working to actually cut those emissions. Now, three years later, utility reporting has been standardized, an emissions trend has emerged, and the results are significant. Graphic 1: A depiction of the volume of methane emissions from California utilities between 2015 and 2016. Emissions from the Aliso Canyon blowout are shown as a separate category. According to the emissions data, from 2015 to 2016, both Pacific Gas and Electric Company (PG&E) and Southern California Gas Company (SoCalGas) have shown a reduction in their total annual emissions of leaked and vented gas. PG&E was in front, with an 11% reduction of natural gas methane emissions, while SoCalGas — the nation’s largest utility — reduced its emissions by 3%. Together – the reduction in emissions from these two utilities is equal to nearly 700,000 metric tons of CO2e on a 20 year basis. Even with the reductions though, there is still much room for improvement. Overall, if you exclude emissions from the Aliso Canyon blowout, natural gas utilities across California emitted about 6.2 billion cubic feet of methane — enough to provide natural gas to over 165,000 homes in California for the year. This is gas that customers paid for but is never delivered – also referred to as Lost and Unaccounted for Gas. The top three sources of emissions are customer meter leaks, distribution pipeline leaks, and distribution station leaks. Together, these three sources comprise 73% of total statewide utility emissions – and each have solutions to reduce their pollution. 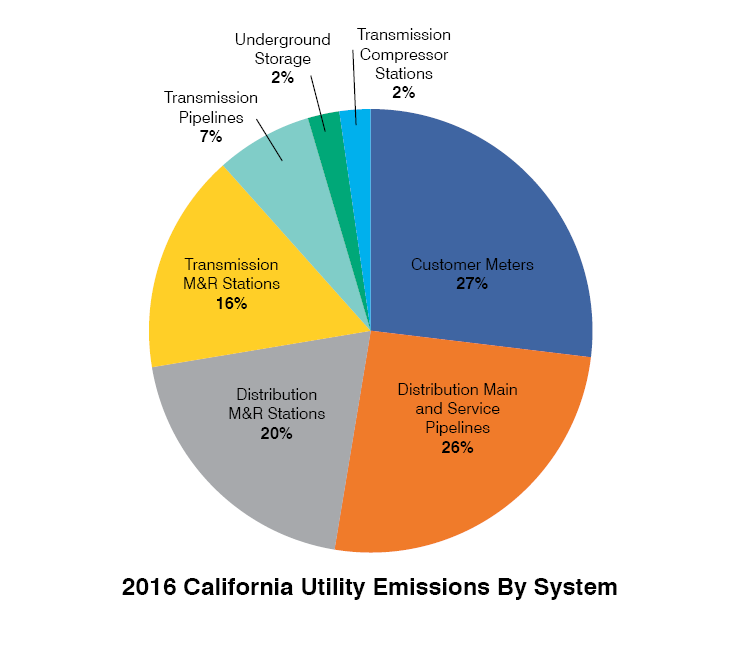 Graphic 2: A depiction of the source categories of methane emissions from California utilities in 2016. Note: emissions from the Aliso Canyon blowout are not included in this analysis. About a quarter of the state’s natural gas emissions from utility systems come from distribution pipelines – and more than half of pipeline leaks are what companies classify as “Grade 3” leaks. Reason being: since Grade 3 leaks are technically non-hazardous, until now companies have not been required to repair them, regardless of size. Looking at discovery dates for Grade 3 leaks shows just how long companies often take to repair these leaks; according to the data some of these leaks were discovered in the late 1980’s and still have not been repaired. Although some utilities have implied they are committed to repairing these older leaks, real and sustained action is needed to ensure continued abatement of all Grade 3 leaks – action which is required in the state’s new leakage abatement program. Public utility companies keep detailed records of leaks they discover, including date of discovery, geographic location, pipeline material, and pipeline pressure. With the new reporting by utilities, the public has access to information on how leakage correlates to pipe material (for example, older cast iron pipes are more leak prone than newer plastic pipes) and other qualities. The data also reveals that some technologies are more effective than others at finding a greater number of gas leaks. PG&E uses advanced leak detection technology to locate a large number of Grade 3 leaks, whereas other utilities do not. This partially explains why PG&E is registering more leaks on its system today than in prior years and also likely part of why they may be experiencing larger emission reductions than others. According to recent analyses, leak discovery is expected to increase in coming years as these technologies are more widely adopted. Requiring companies to report gas leaks has been instrumental in increasing transparency and sheds valuable insights on the tools and practices that can deliver the biggest emission reductions. And it helps utility customers and consumer advocates learn more about the gas that customers pay for but is emitted into the atmosphere. As a result of this data, in June 2017 the California Public Utilities Commission (CPUC) started requiring companies to begin the implementation of 26 best practices for reducing emissions – including targeting and scheduling Grade 3 leaks for repair. Once these practices are fully implemented, utilities are expected to reduce methane emissions by 40% by the year 2030. It’s clear that better leak reporting is a critical part of reducing natural gas emissions. By requiring companies to disclose leak data California is once again demonstrating what climate change leadership looks like and setting a powerful example that other states can follow. This entry was posted in California, Climate, Data Access, Methane, Natural Gas. Bookmark the permalink. Both comments and trackbacks are currently closed.